3 Bedroom Terraced House For Sale in Manchester for Offers Over £150,000. 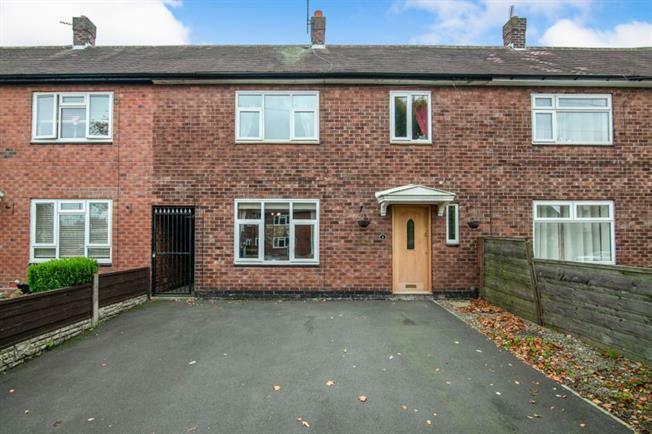 A well presented and spacious three bedroom mid terraced property located in a highly sought after area close to local amenities and transport links such as motorway links, Wythenshawe Hospital, Metrolink. Briefly comprising open plan lounge/dining room and kitchen to the ground floor and three spacious bedrroms, shower room and bathroom to the first floor. Externally, the property benefits from ample off street parking and a good sized garden. Enter the property through the front door into the entrance hallway which gives access to the lounge and dining room and there are stairs rising to the first floor landing. This light and spacious lounge has a double glazed window to the front and is open plan to the dining area. There is an electric fire and radiator. A spacious dining area; perfect for entertaining. There is a double glazed window and double glazed french doors to the rear and there is access to the kitchen. A fitted kitchen with a range of wall and base units with complementary work surfaces over. Integrated appliances include an electric oven with electric hob and extractor fan over and a sink and drainer with mixer tap over. There is space and plumbing for a washing machine. There are double glazed french doors leading to the garden and a double glazed window to the rear. Stairs rise from the entrance hallway to the carpeted landing. There is access to the three bedrooms, shower room and bathroom. A spacious double room with a double glazed window to the front, a radiator and fitted wardrobes. Another spacious double room with a double glazed window to the rear overlooking the garden and a radiator. A surprisingly good sized third bedroom. There is a double glazed window to the front and a radiator. A three piece suite comprising low level WC, wash hand basin and shower cubicle. There is a double glazed frosted window to the rear. A three piece white suite comprising low level WC, wash hand basin and bath with mixer tap and shower over. There is a double glazed frosted window to the rear. The property benefits from ample off road parking to the front. To the rear of the property is a good sized enclosed garden which is mainly flagged. There is a raised decked seating area and a useful storage area.